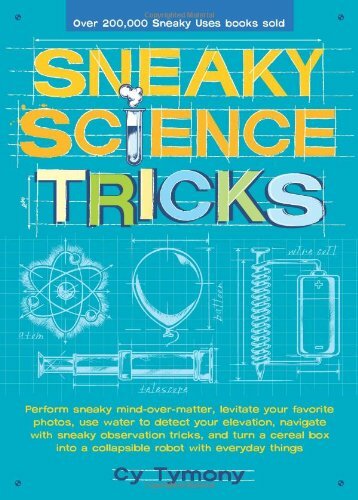 [PDF] Sneaky Science Tricks: Perform Sneaky Mind-Over-Matter, Levitate Your Favorite Photos, Use Water to Detect Your Elevation | Free eBooks Download - EBOOKEE! Description: Author and delightfully mad scientist Cy Tymony combines the fun of his Sneaky Uses series with a host of fascinating science facts and resourceful tricks in Sneaky Science Tricks, a uniquely entertaining and educational how-to guide for the sly and curious among us. This time, Tymony has concocted an ingenious bag of tricks that includes a helicopter, a hand-powered fan, a clever moon direction trick, and many, many other shrewd navigation tools and tons of sneaky trivia on plants and animals, geography, and physics. Each nifty project in the book comes complete with detailed, easy-to-follow instructions and illustrations that fully demonstrate the step-by-step process, making Sneaky Science Tricks an ideal guidebook for sneaky scientists of all ages. No comments for "[PDF] Sneaky Science Tricks: Perform Sneaky Mind-Over-Matter, Levitate Your Favorite Photos, Use Water to Detect Your Elevation".